Fake grass can never replace real, natural grass, but it cannot be denied that artificial grass has achieved certain level of popularity in recent years. With its easy-to-maintain feature and unfading vibrancy, it is never hard to figure why fake grass has become a favorite choice of discerning homeowners. 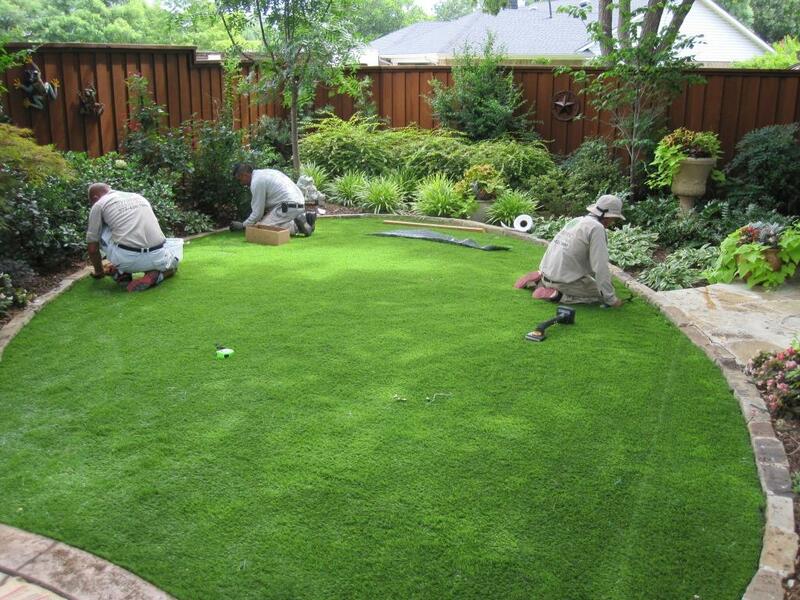 Also known as artificial turf, this product gives homeowners an option shall real grass is not suitable in the area they wish to place it due to some factors such as poor water supply, low light, direct heat, and the like. Laying fake grass is quite easy as it does not require special skill to do it. 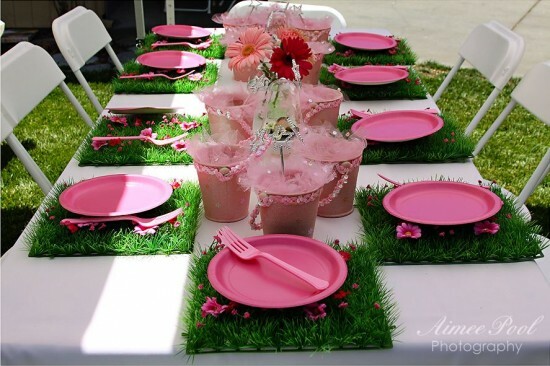 To be able to make a successful installation of fake grass, a base that is smooth and has the correct drainage is important. The best base, though not always necessary, is one that is composed of sand-cement as this combination yields to a mole-free base. On the other hand, if the base is already solid and free of moles, the fake grass can already be installed on the ground. On the ground, install timber in every corner and also install at every 2 meters along the edges. It is important that the timber is level with the surface as it is where the geotextile membrane and the artificial turf will be attached. When the timbers are already properly laid, it is time to roll the geotextile membrane which will serve as the base of the artificial grass. 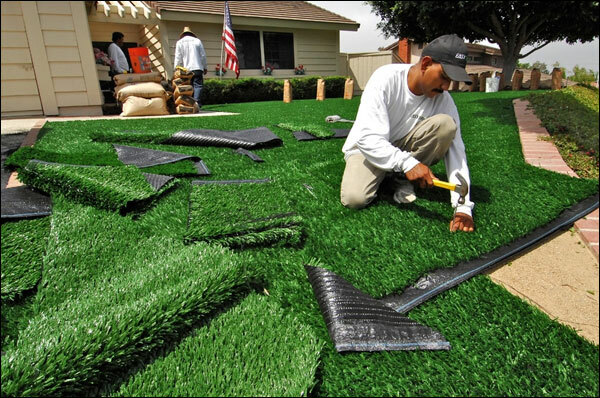 Being placed underneath the fake grass, what geotextile membrane does is to distribute pressure, reduces noise, and prevents weeds. The geotextile is cut according to the size of the ground and is fixed to the timber using nails. Get your Tools for laying Artificial Grass from Amazon. Now that the geotextile membrane, or the base of the fake grass, is already fixed, it is time to unroll the artificial turf. In unrolling the fake grass, it is best that there is only one direction to be followed all throughout the installation. The way to cut the artificial turf is by the use of a very sharp knife. 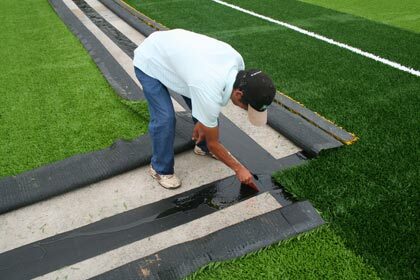 To prevent damages, it is suggested that the artificial turf be cut in a diagonal pattern. When cutting, allow an overlap of about 5 cm before putting the seams all together. After the glue application, the seams are pressed very strongly to close or seal it. To be able to seal the seams successfully, two laborers must perform the task. After the procedure, it is advised to walk along the newly-installed fake grass from end to end and in all corners to check if it is properly pressed. 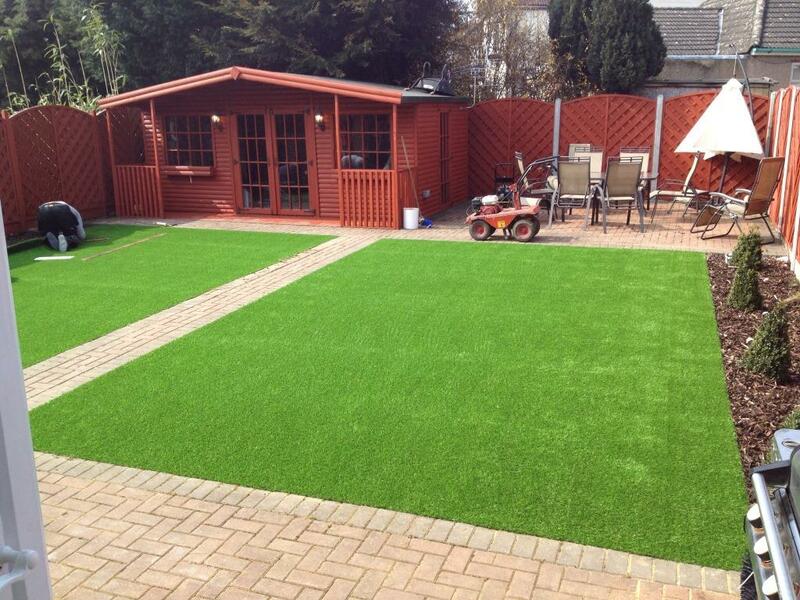 ← Fake Grass Cost – Cheap Artificial Grass or High Quality ?